During flu season, churches are cognizant of the need to keep germs from spreading. This is especially important for churches that use a communal Communion cup. The wine is blessed before Communion. Since the flu virus can spread through close personal contact, churches are working to create an atmosphere where it's OK to bump elbows instead of shaking hands or giving hugs. Boone Hill United Methodist Church will forgo hugs and handshakes this Sunday. Instead, they'll bump elbows during the "Passing of the Peace" as they greet one another in the name of Jesus. “It’s almost hilarious when you see these grown people bumping elbows instead of hugging each other," said the Rev. Steve Garner, pastor of the Summerville church. "It’s a little bit funny on Sunday mornings." The adjustment is one of several ways churches are taking safety precautions this flu season. In addition to encouraging members to cover their coughs and sneezes, ministers across the tricounty region are making minor changes to how they handle Holy Sacraments and moments of fellowship, and are even encouraging members to stay home if necessary. So far this year, there have been seven flu-related deaths in South Carolina and 142 influenza-associated hospitalizations, records from the South Carolina Department of Health and Environmental Control show. Those numbers will almost certainly go up. Last flu season, almost 300 people across the state died. Churches are taking heed as they recognize the importance of safety. But implementing precautions can be tricky because kisses and hugs are often embedded in church culture. Since the flu virus can spread through intimate contact, though, it's important that religious leaders help create an atmosphere where it's OK to deny a hug, pastors said. Like Boone Hill, Boardwalk Church also has adopted fist-bumping as an alternative to shaking hands and hugging. Started during the last flu season in January, the act is now a tradition at the Mount Pleasant church. “It’s become a cultural thing at Boardwalk,” said the church’s planting resident Seth Walker. Other pastors have adjusted the way they perform Holy Sacraments. At New Emanuel AME in Jamestown, Pastor Anya Marsalek Leveille and her clergy staff switched from using gel hand sanitizer in past years to rinsing their hands with soap and water before serving Holy Communion. According to the Centers of Disease Control and Prevention, washing hands is more effective in reducing the number of microbes. Leveille said the clergy wash up while the choir sings, so it's quick and doesn't disturb the experience. "It's really an easy thing," Leveille said. "I don't see us ever going back to the gel. ... I suppose to be totally safe, clergy could wear plastic gloves to serve Communion, but that would totally blow the sacred vibe." For churches who use a common cup, worshipers have questioned for decades it's safety during flu season. 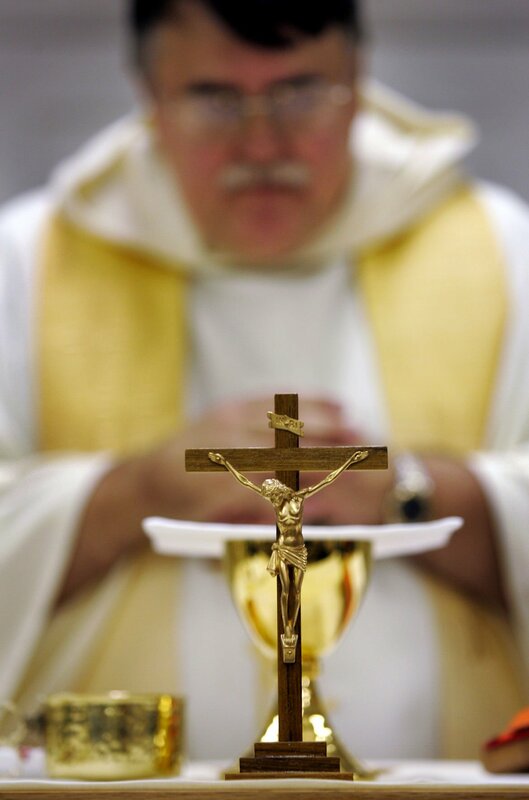 In past years, some Catholic churches have abandoned the practice during which worshipers sip wine, recognized as the blood that Jesus Christ shed in his crucifixion, from the same cup for certain periods when flu outbreaks were rampant. But medical professionals say the routine is only dangerous when a church member is sick. Those who may be ill should take the bread only, which is viewed as a sufficient alternative in some denominations. "If you’re sick or think you're starting to get sick, it's best to not drink out of the Communal Cup," said Dr. Elizabeth Mack, a physician at the Medical University of South Carolina. Medical professionals say getting a flu shot is the best way to keep from getting sick. People also should cover their noses and mouths when coughing or sneezing. Mack said churches should give sick members "permission" to miss church and aim to "not make people feel guilty for being absent." That's the point Garner will emphasize Sunday. “I will tell them if you have a cold or flu, we will forgive you if you do not come Sunday morning," Garner said. Editor's Note: A previous version of this story said that Holy Eucharist wine in the Roman Catholic Church is symbolically viewed as the blood of Jesus Christ. This story has been edited to reflect the belief that the wine is the actual blood of Jesus Christ through Transubstantiation.